We all want to have the perfect smile and beautiful white teeth. Many people have not been blessed by nature with white teeth and they have to pay extra attention to the dental hygiene as well as follow a balanced diet plan. Yellow teeth are often genetic; however they can also be caused by numerous other factors such as hygiene and the type of food and drinks you consume. Our teeth are made up of 4 tissues which are enamel, dentin, pulp and cementum. All these tissues have different roles such as protecting the tooth, supporting the enamel and covering the roots. The tissues that determine the tooth color are dentin and the enamel. Even though your teeth can get stained because of what we consume, there are natural ways you can prevent this from happening, besides proper oral hygiene. 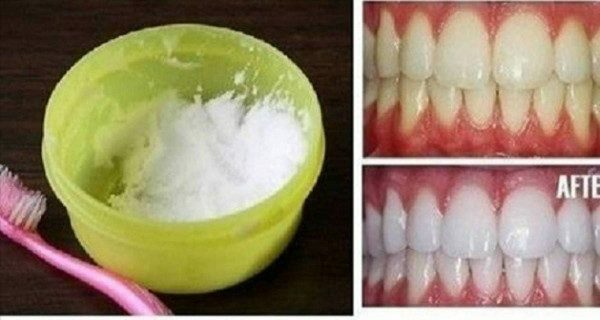 The combination of baking soda and lemon is a natural and very effective remedy for teeth whitening. It is both simple and fast and you can do it in your own home. Put the baking soda in a bowl and add enough lemon juice in order to create a paste. Take a piece of paper towel and use it to wipe the teeth from the extra saliva. Apply the paste using the toothbrush and leave it to act for about one minute. Then rinse it off with water. Baking soda is excellent for removing the stains from the teeth and it also balances the pH levels in the oral cavity. It acts as a mild abrasive and reduces the acidity of the lemon which is an excellent natural bleach.